Fewer than one in four (23%) private landlords have been in touch with tenants to discuss fire safety measures since the Grenfell Tower fire – and even fewer social landlords have done likewise. 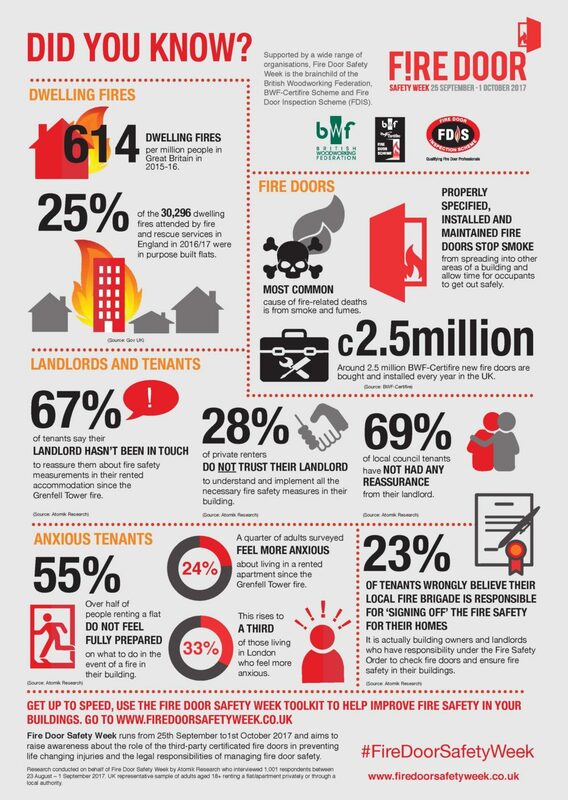 Three months on from the fire, which killed at least 80 people, only 10% of tenants in social housing say they have been contacted by the landlords about fire safety. That’s one of the headline findings of a survey released to coincide with Fire Door Safety Week (25 September-1 October), and the results seem to demonstrate the need for such a campaign. Some 39% of tenants polled said they had seen fire doors propped open and 21% had noticed damage to their building’s fire doors. Forty percent of renters said there is no clear fire escape route displayed. Of the 18% that have reported a fire safety infringement or concern to their landlord, almost a quarter (24%) waited weeks for a response. A majority (55%) say they feel uninformed about what they should do in the event of a fire and about one in four (24%) feel more anxious about living in a rented apartment since the Grenfell Tower fire. The role and importance of fire doors remains widely misunderstood, believes Mansell, who is also BWF technical manager, chair of the Passive Fire Protection Forum and a trustee of the Children’s Burns Trust. “Many people do not realise that the real job of a fire door is to hold back fire, smoke and toxic gases, delaying the spread around a building and keeping the vital means of escape route clear. “They only work properly if they are specified, manufactured, installed and maintained correctly and, of course, closed when a fire breaks out. This is especially important in high rise buildings, houses of multiple occupancy and other types of shared sleeping accommodation. 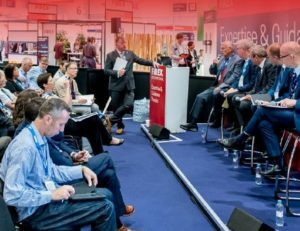 Mansell – who has spoken to IFSEC Global more extensively about the fire safety landscape – believes better education and greater transparency are essential to effect meaningful change. Dany Cotton, London Fire Commissioner, oversaw the fire and rescue service’s response at Grenfell Tower. “London Fire Brigade fully supports Fire Door Safety Week,” she said. “This is an important campaign which drives home the potentially life-saving role that fire doors play in buildings, especially residential buildings such as tower blocks. “It is extremely concerning that the lives of the public and our firefighters are still being put at risk by poorly maintained fire doors and people acting irresponsibly by removing self-closers or by keeping doors wedged open. “It is simple. Proper fire doors save lives, but only if they are correctly made and installed, and certainly not if they are wedged open or in disrepair. Too often our officers walk into a building and see fire doors in an appalling state. We do what we can to advise and enforce the responsibilities of a building owner, but it is time for the responsible person to really step up. Fire Door Safety Week is run by the BWF, the BWF-Certifire Scheme and the Fire Door Inspection Scheme in partnership with the Government’s Fire Kills campaign. In the first instance, contact the landlord or building owner with any concerns. If still concerned and not receiving reassurance, then contact the relevant local authority or local fire and rescue service for advice. IFSEC Global is proud to support Fire Door Safety Week, which runs from 25 September to 1 October. You can pledge your support for the campaign here, and by tweeting under the hashtag #FireDoorSafetyWeek and sharing or using the wealth of resources found in the campaign’s toolkit – which includes a downloadable ‘Responsible Person’ poster. The site also includes advice aimed at fire and health and safety professionals. Residential landlords still haven’t learned Grenfell lessons – especially in social housing, survey reveals Fewer than one in four (23%) private landlords have been in touch with tenants to discuss fire safety measures since the Grenfell Tower fire – and even fewer social landlords have done likewise.